As you begin your search for the right insurance, there are plenty of things that you may not understand. That is why I have put together a short list of some of the best tips to follow when you are starting your search for insurance. Some of these tips may even apply if you have purchased insurance before. When looking for insurance, your number one priority should be to find adequate coverage. Price is important, but you’ll want to determine what kind of coverage you need first. Then you can fit that coverage into your budget and determine which carrier can provide you with the most comprehensive policy for your situation. You may be tempted to choose insurance with the lowest price tag, but if you don’t have enough coverage (or the right kind of coverage), you will see less financial benefit when it comes time to file a claim. Once you evaluate your coverage needs, factor in your budget and find ways to save. Ask your insurance agent if there are any discounts on your coverage. Often, carriers offer discounts for things like paying your policy in full, staying auto accident-free or, if you’re in school, getting good grades. You also can save money by “bundling” multiple policies, such as purchasing a home and auto policy from the same carrier. An average policy will cover the basics, but you may need to add extra coverage to meet your unique needs. For instance, you may have items like electronics or a nice piece of jewelry that would be financially difficult to replace, even with the assistance of your average renters or homeowners policy. You may want to add additional coverage for these items. 4. Purchase life insurance—you aren’t too young. Life insurance is essential, no matter how young or old you are. And for millennial’s, buying now may be a smart move because it’s cheaper to buy a life insurance policy when you’re young and healthy. This kind of insurance can help your family cover unexpected costs in your absence, including student loan debt or a mortgage, in addition to end-of-life costs. And if you have kids, a life insurance policy can also support their education or childcare expenses. Additionally, every millennial should consider long-term disability coverage, which helps you stay afloat financially if an accident happens and you become disabled and unable to work. 5. Talk to an independent agent. An independent insurance agent is an essential resource when purchasing insurance—especially if this is your first time. 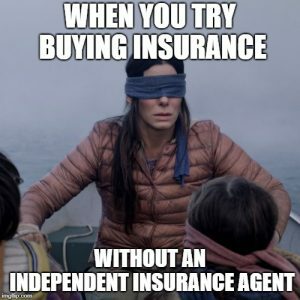 An independent agent works with multiple different carriers, which is different from captive agents who can only sell insurance from the carrier they work for. Working with an independent agent can help make sure that you are getting the best coverage, for the best price. You’ll also benefit from independent agents’ insurance knowledge; they know how to talk you through your options and actually explain what each policy includes. An independent agent will make sure all of your assets are covered, help you find discounts or other ways to save, and be a valuable resource as your life changes and your insurance needs change, too. Next Post: Why is My Car Insurance Going Up – And What Can I do About It?